By hiring a local SydeWyrker! 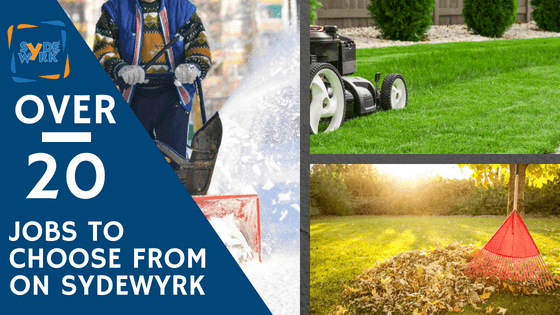 Find reviewed, local SydeWyrkers to help with your outdoor chores. 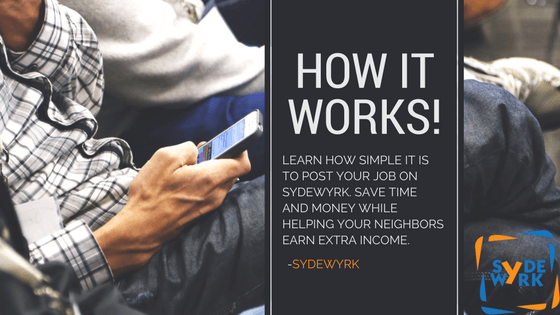 SydeWyrk is an online marketplace platform, that connects busy homeowners with individuals in their neighborhood, who are looking to earn money by picking up side work. There are MANY ways to find help around your property. But they all tend to require A TON of inconveniences for both the customer and the worker. SydeWyrk changes that! Choose from our list of pre-priced jobs, fill in the necessary information, and post it to our marketplace. Registered SydeWyrker’s will get notifications of your job and have a chance to request hire. 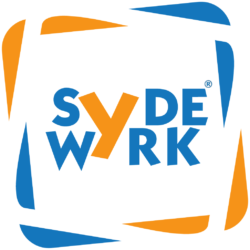 Browse the SydeWyrker’s rated and reviewed profile to decide whether or not to hire them. 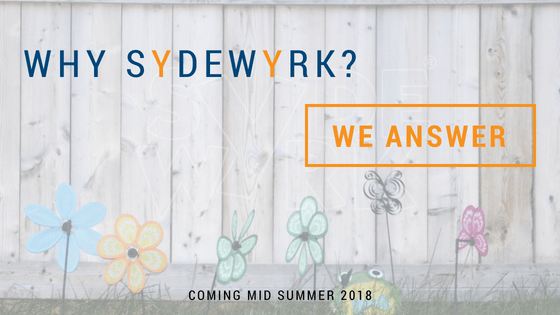 Review your SydeWyrker’s performance and you’re done! The transaction is handled within the app making it a seamless, easy process! Start making money as a SydeWyrker! ﻿No more need to post all of your odd jobs on a Facebook page, only to get recommendations of companies that are too busy for your one time job, or a friend of a friends neighbor that might be available. Then you still have to work out a form of payment! This process is inconvenient, and exhausting! Know EXACTLY who will be doing work on your property. You can view each SydeWyrker profile before you hire them. See their photo, five star rating, reviews, and photos from previous jobs! Of course we are on Mobile, but feel free to use our user friendly Desktop App as well. No need for Cash, or a physical transaction. All payments are handled within the app for a seemless experience. No more quotes or price haggling. We pre-price the jobs on the platform based on job type and size. Can’t get your lawn mowed for the big party? Saving your back from the big leaf pickup? No equipment for fertilizing your lawn? There are SydeWyrkers that have you covered. 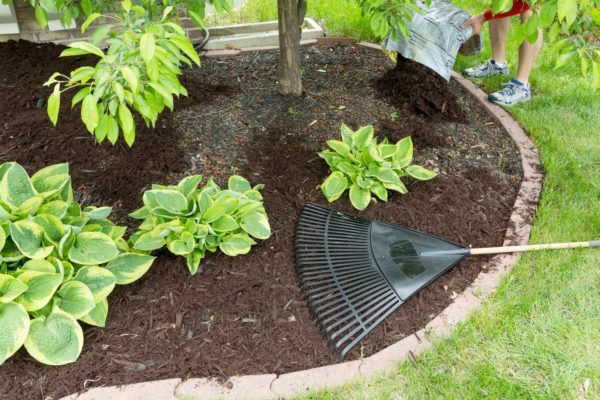 Simple mulching around your property to planting beautiful rose bushes. You can find help to give you that curb appeal to stand out in the neighborhood. Need to move a big item but only have a car? Find a neighborhood SydeWyrker to deliver your mulch, haul away yard waste, or move your couch across town. Snow can come at the least convenient times. 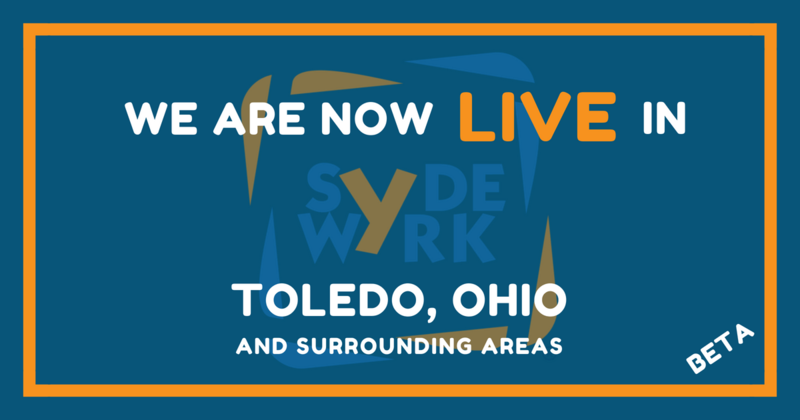 Post a Job and have a SydeWyrker clear your drive and sidewalk no matter if you’re at work, kids activity, or lounging around watching TV. Green mold growing on your siding? Patio turning your feet black? Concrete starting to look like blacktop? Hire someone to blast your hard surfaces back to looking new. We all LOVE our pets, but nobody enjoys cleaning up after them. Hire someone to do the dirty work and enjoy your clean yard. Sometimes those automatic car washes just don’t cut it. Get all the road grime off your car with a hand wash. All you need to do is supply the water source! Get those trees and bushes into shape! Curb appeal can be greatly improved with some well maintained trees and bushes! Sign Up and start putting time back in your schedule! Keep up with us as we Start Up! Sign up for our newsletter or check back here to keep up with our progress as we launch the newest online platform in the gig economy.